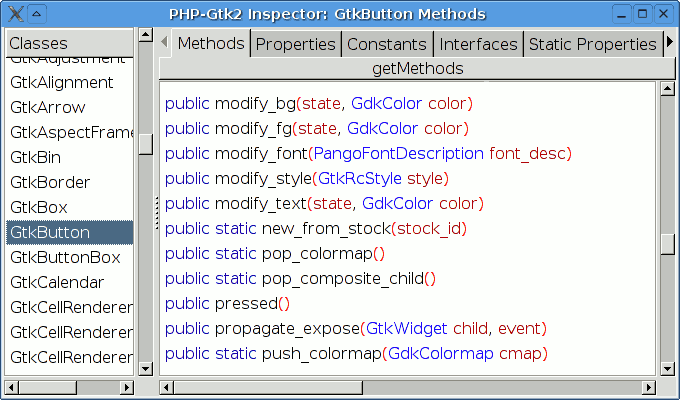 This tool is a reflection browser for PHP, especially for PHP-Gtk2. It uses the reflection functions in PHP5 to discover all classes, their methods with parameters and types, constants, signals and so. I developed it as a live reference because the docs aren't complete yet, and it does a fairly good job at this. You can search classes and methods by focussing the list and typing in the first letters of the item you search. Method 1: Installation via PEAR. Extract it and start the run.phpw with php.